National Demo for Free Education 2014! Why Mask Up at Protests? Friends of the UCL Cut the Rent Campaign have produced a wonderful pamphlet detailing the background and history of this inspirational grassroots campaign. As students living in London and paying tens of thousands of pounds to gain a degree that will most likely never lead to the fulfilling career we were falsely promised, the best we can realistically expect is a life devoid of happiness and security. Luckily, our university recognises our plight, as this common knowledge has now been turned into official UCL policy. With the new extenuating circumstances regulations, circumstances such as “exam stress, financial problems, accommodation problems or domestic problems” are considered a part of the “everyday reality” of being a student, and UCL has decided that these situations are not in and of themselves sufficient grounds for extenuating circumstances. Because that’s just what student life is like in these times of marketised further education, right? Under the new extenuating circumstances policy, it seems it will be almost impossible to get a deadline extension. The university is extremely unlikely to accept applications based on medical conditions that have not been fully diagnosed, or conditions that are already covered under examination arrangements. Furthermore, situations that were disclosed late will not be considered. Not only do you need to go through reams of paperwork to apply for an extension and submit appropriate evidence, you could also be waiting for days to hear back from the faculty panel. Even more worryingly, these changes will predominantly affect students with ongoing medical issues, disabilities, learning difficulties and mental health conditions, as these situations are no longer acceptable grounds for extenuating circumstances. One of the aims of the new regulations is to “foster a professional approach” through requiring students to “accept responsibility for their conduct” – after all, it’s not like some aspects of your life could ever be out of your control. This gives us a glimpse into the university’s attitude towards the student body: UCL seems essentially distrusting of students, and regards struggles in the face of difficult personal circumstances as a sign of weakness, not a reality of life that affects us all. The university seems to suggest that a student can reasonably be expected not to experience any personal difficulties during a three-year degree – or at least, to be able to perform to their best ability regardless of any hardship. It’s our everyday reality as students after all. UCL Defend Education, in conjunction with UCLU, has launched the #withoutEC campaign, collecting stories from students who have applied for extenuating circumstances in the past. Our goal is to highlight the importance of a fair and non-discriminatory extenuating circumstances policy, and to stress the importance of an adequate support system at university. The stories collected will be used (anonymously) to lobby UCL to repeal the new regulations. So while you’re attending the funeral of a loved one, living off pot noodles for the third week in a row, or crying yourself to sleep every night from sheer stress and exhaustion, while your flat in halls has no hot water (again), just remember: UCL is “committed to the wellbeing and safety of our students” and seeks to “ensure your university experience is a fulfilling, healthy and enjoyable one”. Just don’t ask for an extension. Save public education before it’s murdered by the market! As if hiking our loan repayments, and cutting maintenance grants and Disabled Students’ Allowance, wasn’t enough for the Tory government, now they’ve unveiled plans for the worst attacks on education in decades. If we let them get away with it, it will mean the death of public education as we know it. The power to raise the undergrad fee cap – already at £9000 – will be handed to ministers without even needing Parliament to vote. The Tories have learned from the massive protests in 2010 when Parliament voted to triple fees and students hit the streets and occupied campuses, coming dangerously close to getting enough MPs to rebel and stop the policy – now they want to do it behind closed doors. Even more sinister are the plans for marketization. After multiple failed attempts to make higher education a competitive market, the Conservatives are going to hammer universities into an artificial market serving business. Jo Johnson, the minister responsible, described his vision of universities as no more than a “pipeline of graduates” supplying industry. Universities will be factories, where students are just raw material, to be moulded into ready-made workers for the benefit of employers. Universities will be made to compete in a “Teaching Excellence Framework”, which will value teaching against metrics and tickboxes like graduate destination statistics and flawed “consumer satisfaction” surveys. The government wants education to serve the interests of employers and big business, rather than being a place for critical thinking, challenges to power and intellectual and artistic exploration. This will be reinforced by an even more narrow-minded assessment exercise in research, restricting academic freedom. Arts, humanities, social sciences and blue-sky science – anything that doesn’t serve short-term profits – face yet more pressure. Universities that score well will be allowed to raise their fees above £9,000, worsening inequality in a divided system. Meanwhile the plans include preparations for worse-scoring public universities to be allowed to shut, collapsing under the weight of years of attacks. Simultaneously, further and life-long education face cuts that could shut 40% of further education and sixth form colleges. In public universities’ place will rise private institutions prioritising shareholder profits over students: the reforms will give unfair assistance to these new providers, such as looser regulation of student numbers, and easier access to the right to call themselves “universities” and to public money. Teaching quality won’t be improved by a competitive market. It depends instead on the resources available and teaching staff working conditions. We need to reverse years of squeezed funding, and the underpayment, overstretching and demoralisation of staff – especially precarious casualised academics like postgrad teaching assistants. Instead of using these metrics to intensify the pressure, exhaustion and insecurity of our staff, we want decent funding for teaching, and good pay and secure jobs for our teachers. These shouldn’t be funded by boosting fees – education should be free – but by taxing the rich and their businesses, and putting the banks we bailed out and their investments under democratic control. Our society has huge resources – we should put them to better use redistributing wealth and serving education, healthcare and public services. Finally, even our ability to defend ourselves and education is under threat. The new trade union law places incredibly undemocratic restrictions on our staff’s ability to take action, and our student unions – already bureaucratised and tied down by regulations – face a similar threat as part of the reforms. The outlook is bleak but we can beat these changes. We need to spread awareness, organise together, and use protest and direct action to force the government to drop the plans. UCL Defend Education, as part of the National Campaign Against Fees & Cuts, will be doing our bit here at UCL and we need you to get involved too. The battle starts with a protest, meeting 1pm 26 November at the main Quad. See you there! 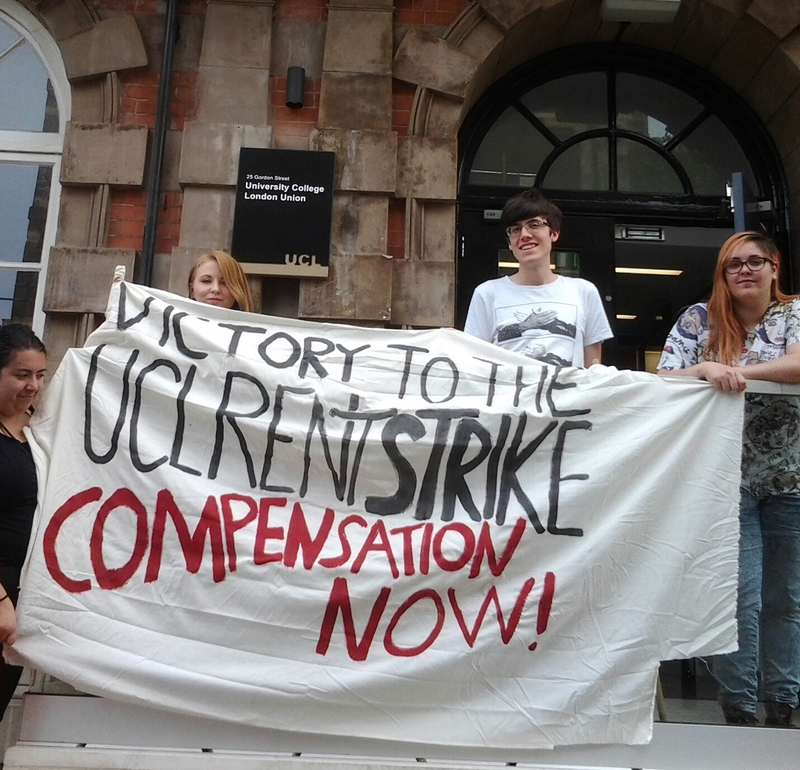 Direct action paid off for the UCL Rent Strikers! ….And we will do it again! Earlier this week UCL forked out £100k in compensation to residents of Campbell House West following 7 months of protest, strike action, and hard graft. Full compensation to all 87 former residents of Campbell house West. Each resident is to receive up to £1368 in compensation following the dispute over unbearable living conditions and vermin infestations. UCL repeatedly responded with neglect, delay, and breach of contract. The rent strike started on 8 May and during that time 17 complaint forms were submitted by to management. The strike was accompanied by more protests and direct actions. By the 10 October, there was still no outcome. Students at Campbell House WON! UCL did not only respond with senseless bureaucracy and lazy treatment, but also with illegal threats of academic sanctions and expulsion over withholding rent. This, of course, was totally illegal, and nothing but scare tactics. Commenting on UCL’s response, Pascal LeTendre-Hanns (UCL Union Officer) said that: “The important thing is how much of an upward struggle it’s been for the residents and those supporting the campaign. UCL management have delayed, obfuscated and denied responsibility at every stage; that’s why this full compensation is such a huge vindication of the cause”. For “UCL, Cut The Rent”, this is only the start. We’re now looking to get wider to get results for inhabitants of other halls, where UCL fails to adequately maintain facilities and justify their supernormal profit. Many students I have spoken to are hit hard in an attempt to make ends meet. Maintenance loans and grants almost never cover it, let alone allow some sort of weekly budget. By celebrating the success of the Campbell House West Dispute, we demonstrate and maintain that students do not have to be exploited. UCL Management has been beaten, and can be beaten again. Wider action is on the cards with a larger and more empowered group of students from other halls, including a housing bloc at the 4th November student demo! Support the campaign on twitter and Facebook! Find out more, get involved and together we’ll stop monetisation of student accommodation. Students and our education are under attack like never before. We have already seen the tripling of tuition fees in 2010, a measure that barred many potential students from coming to university. Meanwhile, our education has been steadily marketised, with our institutions run like businesses aiming to generate profit. Now the government intends to entirely scrap maintenance grants, replacing them with loans. This will mean that students from the poorest backgrounds take on yet more debt in order to access an education – if they even start at university in the first place. We know that many students who relied on maintenance grants in order to make it through their degree simply would not have been able to come if they had been forced to take on thousands of pounds more of debt instead. We know that the system was not fit for purpose in the first place. Any system for allowing access to grants which is based on means testing will mean that some students do not receive that they need. It is difficult to legally prove estrangement from your parents, which means that many LGBTQ students who do not receive financial support from ‘phobic parents are unable to claim the amount of grant that they require. We can’t argue that we should keep the current system: we need to demand a radical change, with living maintenance grants for everyone. We cannot and will not sit quietly as the government destroys the final chance for anyone other than the vastly rich to go to university. All around the country, students are mobilising. Students organised a series of protests and occupations of MPs’ offices in mid-September, demanding that they oppose government plans to scrap maintenance grants. On October 14, students will be demonstrating at the Department for Business, Innovation and Skills to demand #GrantsNotDebt, and on November 4, students from all over the UK will converge on central London to march in our thousands to demand free education and living grants for all – no barriers, no borders, and no business. Also don’t miss our UCL activist meeting on Monday evening to find out more about how to get involved on campus! ‘WTF is Going on? : The fight for free education’ – full details here. And, the next meeting of our ‘UCL, Cut the Rent‘ campaign on Wednesday. Details here. In a letter to the Cut The Rent Campaign in March 2015, Vice Provost Rex Knight claimed that students in UCL accommodation ‘need to generate a contribution.’ By this he meant that that the annual income from our rents needs to be higher than the running costs of the halls. Furthermore, he argues, the surplus needs to increase every year. He wants the surplus to rise from just below £10m to £15m between 2014 and 2016 alone. 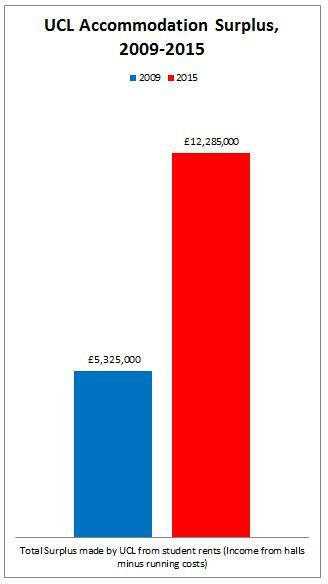 This is a rise from a surplus of around £5m in 2009 (see graph). In 2014 UCL’s total income from rent was £31m and in 2016 it’s expected to be £34m. In other words, we can expect that between 2014 and 2016 32-44% of our rent won’t pay for the running costs of halls but for capital investment. The claim that this money has to come out of students’ pockets is a myth. Investment to improve the standards of halls is solely needed. However, the problem is that the money for these future redevelopments has been taken from students by raising rents at a rate far higher than inflation. Not only will students never see the benefits of the surplus we are generating but we are also paying more, proportionately and in real terms, every year. As a result, a huge number of rooms at UCL are now completely unaffordable. Does UCL have other option than to exploit students in this way? Of course they do. UCL has a lot of money. Over the next few year management want to increase the university’s overall surplus from 2.5 to 5.5% – sending an additional £47m going into the coffers every year. This is so that UCL can fulfil huge investments in new campus buildings. Between now and 2025 the bosses are planning to invest over £1bn in new facilities in Bloomsbury and Stratford. In principle there’s nothing wrong with these investments – because management decided to drastically increase student numbers we need more space. But it proves that for management raising the rent for students is not a must, it’s a matter of priorities. UCL could reduce the rate of its billion pound investments by 0.01% and afford to cut our rent by 40% if they wanted to. They chose not to, and no students were involved in making this decision. The increase in UCL rent surplus since 2009. A year later, the number of top staff and bosses earning over £100,000 had increased to 429, and top incomes rose to £350,000. All-in-all, the cost of paying these salaries went up by at least £7.5m, to at least £59,150,000. During the same period, rents for students went up by around 5%. Students became more exploited at the same time as those earning above £100,000 were paid more. From page 36 of the UCL Annual Report. Compare these sums to the income and the surplus generated from students’ rent. Between 2014 and 2015 the UCL predicted an increase in the income from student accommodation by about £2m, from £31m to £33m. This meant yet another above-inflation rent increase for students. However, what these statistics demonstrate is that if UCL had frozen (not cut) the money they put into management pay in 2013, they could have instantly slashed rents by 24%, rather than increase them the following year. The point here is not to say that there is a dichotomy between estates investment and student rents, or between management pay and student rents. Rather, it is to point out that the UCL has the money to cut rents for students if they wanted to, were they to rebalance their budgets. Student accommodation does not necessarily have to generate a surplus in order for UCL to keep improving standards in halls – it’s a matter of priorities. What we can conclude is that UCL is currently prioritising higher rents for students and higher pay for managers and that no students were involved in setting out these priorities. Now the field is open to agree or disagree with these priorities. You can get involved in the ‘UCL, Cut the Rent’ Campaign at the next planning meeting on Wednesday. Full details here. Also don’t miss the next UCL Defend Education activist organising meeting on Monday, here. Jeremy Corbyn: What Next for the Left? In May of this year, the Tories managed to gain an overall majority in the general election and got ready to continue in power for five more years, with plans of implementing even more devastating cuts to public services and an unrelenting austerity agenda. Imagine if someone had said at the time that a few months later, the Labour party would be led by the vice-chair of the Campaign for Nuclear Disarmament, a patron of the Palestine Solidarity Campaign and a man who had voted against the previous Labour government hundreds of times. Imagine if someone had said that this man would have as his Shadow Chancellor someone who described one of his hobbies as “generally fomenting the overthrow of capitalism”. It would probably have sounded somewhat surprising. But that is of course exactly what has happened. After over a hundred thousand people joined the Labour Party, as well as many registering as supporters, Jeremy Corbyn, initially quite the outsider with some bookies offering odds of 100-1 for his winning, was elected by a landslide on a mandate to oppose austerity and change the direction that Labour had been going down for many years. 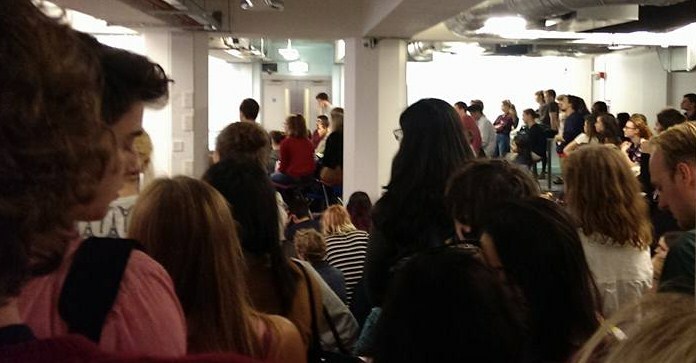 Our meeting to discuss the Corbyn phenomenon at UCL a few days ago was absolutely packed. Corbyn has chosen as his Shadow Chancellor John McDonnell, someone who has not only had a track record of opposing Tory attacks on working people, but who also has supported student protests in the past. This included visiting student occupations at UCL in 2010 and 2012 to show his solidarity! promising to support strikes in future. The new Labour leader’s anti-austerity politics carried over also into education and debt, where he promised to end tuition fees, leading him to be very popular with student voters and being officially supported by the National Campaign Against Fees and Cuts. Since Corbyn’s elections Labour MPs appear to be more decisive in their opposition to the government’s attack on workers’ rights. With the current Tory government planning on ending maintenance grants and furthering marketisation of education with the “Teaching Excellence Framework”, this has come as encouraging news. But this honeymoon period can’t last forever. On September 20, various youth and student groups as well as individual Labour party members that had been supportive of the campaign to get Corbyn elected came together to set up a new organisation, Labour Young Socialists, in order to build on the momentum from the campaign and to further socialist ideas and democracy within Young Labour and Labour Students as well as the wider party. If you’re a Labour member, get involved with Labour Young Socialists as well as your local Constituency Labour Party and fight for the socialist policies that Labour desperately needs.